Chicago-based James McHugh Construction Co., one of the top concrete building contractors, has appointed Dave Alexander as president. He joined the firm as an intern and has served as a project manager, chief estimator, and, most recently, senior vice president. McHugh Construction officials cite his industry-leading engineering, technical, and management skills, as evidenced in some of the most expensive, complex and high profile projects in Chicago. Topping that list is the 1,143-ft. Trump International Hotel and Tower, which was North America’s tallest reinforced concrete building from 2007-2014. Alexander will oversee all company operations, directing its multidisciplinary team toward continued success in high-rise residential projects, concrete construction, historic restoration, ultra-high luxury hospitality, entertainment, special use, rail and infrastructure works. His appointment follows the retirement of Bruce Lake, whose tenure with McHugh spans nearly four decades, including 20 years as president. University of Illinois Professor of Civil and Environmental Engineering David Lange was elected 2018-19 American Concrete Institute president during The Concrete Convention and Exposition in Salt Lake City. Joining him for two-year terms are Vice President Jeffrey Coleman, principal partner of The Coleman Law Firm, Minneapolis; and, Senior Vice President Randall Poston, senior principal, Pivot Engineers, Austin, Texas. ACI also elected four new directors to three-year board terms: Dr. Heather Brown, FACI, director of the newly formed School of Concrete and Construction Management at Middle Tennessee State University, Murfreesboro; Mark Cheek, vice president of The Beta Group in Gretna, La. ; Michael Paul, principal structural engineer, Larsen & Landis, Philadelphia office; and, Michelle Wilson, director of Concrete Technology, Portland Cement Association, Skokie, Ill. 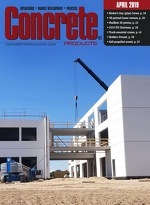 Separately, ACI and the American Society of Concrete Contractors have designated ACI Committee 310, Decorative Concrete, a joint ACI-ASCC committee, tasked with compiling and releasing information on the application of artistic finishes of cast-in-place concrete; avoiding duplication of efforts; and, speeding document development. Joint participation also offers greater prospect of funds for research and experimentation, wider acceptance of results, and a pre-Summer launch of ACI Decorative Concrete Flatwork Finisher and Technician certification programs. Both certifications require completion of a written exam, plus current Concrete Flatwork Technician certification. ASCC will be offering the exams at its 2018 conference, September 20-23 in Charlotte, N.C.
“The ability to collaborate with the American Concrete Institute on publications and educational programming relative to decorative concrete is a fantastic opportunity for ASCC and the Decorative Concrete Council,” notes ASCC Executive Director Beverly Garnant. As a Society specialty council, DCC focuses on the issues, trends and work of the decorative concrete industry, she adds, and is celebrating its 20th anniversary this year. Anthony Tilton of Cotney Construction Law, LLP was recently named general counsel of the Tile Roofing Institute, Tallahassee, Fla. He will assist the concrete and clay tile producer group in market development and code matters; corporate structure and bylaws guidance; plus, board of director, operations, regulatory compliance, and governance policies. Tilton covers all aspects of construction law, but concentrates on matters relating to the Occupational Safety & Health Administration and licensing defense, specifically litigation and the appeals process for citations involving catastrophic construction or industry related accidents. He also manages and develops safety and health strategies for construction contractors and industrial facilities across the United States. The National Precast Concrete Association has released 2018 Selected ASTM Standards for Precast and Prestressed Concrete, available for $475 ($630 nonmembers) in book or CD format, from the NPCA Shop at www.precast.org or by calling 800/366-7731.